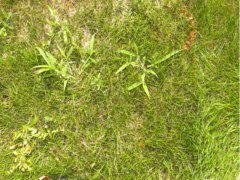 Crabgrass is the most common lawn weed. It is an annual, narrowleaf weed. You may be wondering, what is an annual and what is a narrowleaf weed? An annual grows or germinates, produces seed and dies all in one single year. 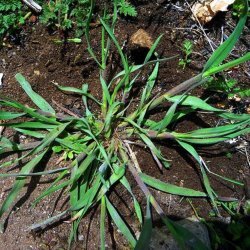 A narrowleaf weed looks and acts like grass to you and me. This specific type of lawn weed is known to be a warm weather weed. It starts growing in early spring. The seeds start attacking your lawn at the height of the summer heat and drought. This is when your lawn begins to thin out and go dormant. To put it in simple terms, your lawn will be prone to this specific lawn weed if it is thin, it is mowed too low and it is watered too much. It has a lighter color green and a much wider and thicker blade than regular grass. Personal Note: Potential customers and friends will often ask me, "Why do I have crabgrass in my lawn. I do everything that I should (mow, fertilize and water). What am I doing wrong?" My automatic response is that going through the motions is not enough. There is a correct and an incorrect way to do everything. Lawn maintenance is no exception. Control of this lawn weed is very easy to practice without the use of chemicals. By altering a few things in your lawn care regiment, you are taking a huge step in the right direction. The single most important prevention measure is do not cut the grass blades too short. Keep the blades about 3 inches in length. In order to germinate it needs sunlight. If you mow a little higher than you would like (i.e. 3 inches in height) rather than the 2 inches in height you prefer, it will create shade. The shade will help prevent this lawn weed from growing and attacking your lawn. Keep your lawn well watered during the height of the summer heat. You do not want to soak the area, you want to make sure you water deeply so that it promotes grass root growth. Fertilize your lawn in the Spring and Fall. Do not fertilize during the height of the summer when your lawn is going dormant. When your lawn goes dormant it won't feed on the fertilizer, it is sleeping and not actively doing anything. If I may say, you are enabling it by allowing this pesky lawn weed to come and steal all of the nutritional value the fertilizer provides. Eliminate bare spots in your lawn by overseeding in the fall when the weed dies. It is not a good idea to overseed in the late Spring/early Summer because it is getting ready to germinate. Pick by hand or using an instrument any plants you see growing during the season. Return from crabgrass to lawn weeds. In early Spring apply a pre-emergent herbicide. March or April is a good time for the application. Once the weather hits 50 degrees fahrenheit for three days in a row is when this weed begins to germinate. If you see plants growing during the season pull them out. NOTE: If you plan on reseeding or seeding your lawn, do not apply the pre-emergent. The pre-emergent keeps the grass seed from germinating. Fall is the best time to overseed anyways. If you could not control the weed in early Spring, you have another option. You can apply a post-emergence grass friendly spray herbicide. By only applying the chemical to the plant itself, you should see results within a few days. The exact time frame depends on the product you purchase. NOTE: You do not want to purchase a total vegetation killer because it will not only kill the weeds, it will also kill your grass. Products you can use to rid your lawn of crabgrass. By following this simple plan, you can get your crabgrass problem under control. Proper care of your lawn will ensure the health of it. From crabgrass to the Lawncare Home Page. Crabgrass located in it's favorite spot, a thin lawn. The lawn is very sparse. This is a prime spot for the new crabgrass sprouts. 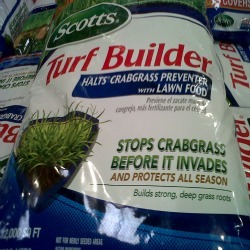 Crabgrass prevention and fertilizer all in one product.